Community Jobs Training is far different than training someone to do their job well. You’re training them to leave The RE Store with an arsenal of experience that will allow them to go out into the world and find something that gives them meaning and gives them the opportunity to make something of their careers. The beautiful thing about teaching job skills in our community is that everyone has something to teach and everyone has something to learn. Job training takes a village, as they say. In 2012, a group of people kicked off a worldwide movement called #GivingTuesday. Celebrated on the Tuesday following Thanksgiving, #GivingTuesday was started with the goal of taking back the holiday season by celebrating the joy of giving. Today, #GivingTuesday has become a global day of giving powered by social media. For us, #GivingTuesday is a chance to tap into the power of our community in order to inspire hope, build confidence and create “Aha!” moments. When we began partnering with social justice organizations in town, we took on the challenge of providing free and meaningful job training to underserved populations. Since 2015, we’ve provided nearly 8,500 hours of free training to over 70 people, ensuring that much needed job skills are available to all. By giving someone a chance, you give them hope. 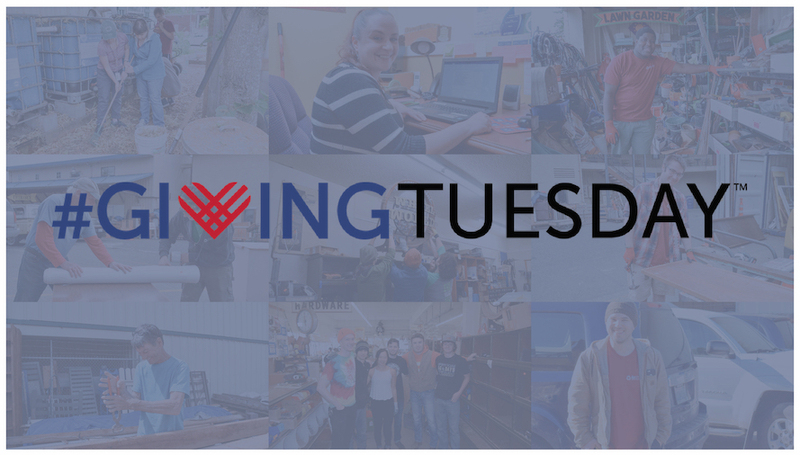 This #GivingTuesday we are raising $2,500 to purchase safety equipment for trainees. Your gift of $25 will allow us to provide gloves, boots, safety glasses, a uniform, and industrial safety training for trainees in 2019. What better way to celebrate the true meaning of the holiday season than by giving the gift of hope and confidence? By supporting The RE Store on Giving Tuesday, we’ll be able to ensure that each trainee shows up to work confident in their safety gear; ready to learn valuable new skills that will allow them to find and keep meaningful employment. In a community such as ours, in which the job market is tough and housing prices are rising, Community Jobs Training helps to create a more confident, educated, and healthy workforce. Community Jobs Training has proven results. With their newly acquired skills and confidence, nearly all of our graduated trainees find full time, stable employment. You may even see some of those faces around The RE Store – we’ve hired 7 trainees in the past two years! Community Jobs Training is primary funded by generous donors like you. With your help, we can provide valuable job training experiences to even more community members. To help us reach our goal, you can visit our donation page, tell your friends, and share our story! If you can’t wait until #Giving Tuesday, consider donating today. Your help matters. It ensures that everyone has access to job training, not just those who can afford it.